MOSCOW. 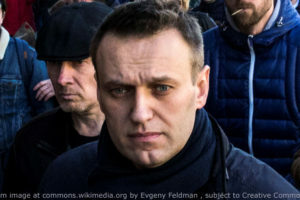 Nov 13 (Interfax) – The enforcement proceedings in the “second Kirovles case” cannot be the reason opposition politician Alexei Navalny has been banned from traveling abroad, as they were opened less than five days ago, according to Navalny. “The law allows five days for the voluntary execution of a warrant by court bailiffs,” Navalny said on his website on Tuesday. Enforcement proceedings on recovering 2.1 million rubles in damages in the Kirovles case were opened on November 9, he said. “That is, if they started the proceedings on November 9, 2018, I had to be notified. After that, the counting of the five days starts. After that, some measures can be made, primarily the freezing of a bank account. And only then, if nothing works, can a decision on restricting leaving [the country] be made,” he said. “All this time, my lawyer has kept the money, as we could not pay: no bank details were provided regarding where to transfer it,” Navalny said. The penalty “has already been paid,” he said.